After an interview, it’s important to follow up with a thank you note as soon as possible. Your thank you note gives you a chance to reiterate your interest in the job, highlight important qualifications, and follow up on any details you were unable to mention during the interview. A thank you note also shows your interviewer that you appreciate their time, and are eager to hear from them soon. Read below for tips on how to write a thank you letter after an interview. Then use the template below to start your own thank you note. Simply replace the generic information in the template below with your information. Then personalize the letter so it focuses on your appreciation for the interview, your interest in the position, and the assets that qualify you for the job. Use the first paragraph to thank the interviewer for taking the time to meet with you. Mention your interest in the job and how enthusiastic you are about it. You might also mention something small about your interaction to jog the employer’s memory about you (for example, if you found out you are from the same hometown, or that you root for the same sports team). The second paragraph of your thank you letter should include (briefly) the reasons why you are an excellent candidate for the job. List specific skills that relate to the job you interviewed for. The more detailed you are, the more the interviewer will remember about your qualifications. The third paragraph (optional) can be used to mention anything that you didn't bring up at the interview that you'd like the employer to know. You can also elaborate on a point you felt needed more time. This gives you another chance to make a good impression, especially if you remembered something you should have said after the interview. If you feel that the interview did not go well, you can also use this as a space to (briefly) explain why you were off your game, or to re-answer any questions you struggled with in the interview. In your closing paragraph, reiterate your appreciation for being considered for the job and let the interviewer know you are looking forward to hearing from him or her soon. Send it quickly. Send your thank you note as soon as you can after the interview, since you want it to be received while the employer is still considering candidates. Your well written message or letter may be what secures you a second interview or a job offer. If you have a little more time, send your thank you message in the mail. You can either send a letter in the form of a formal business letter, or you can send a more personal thank you note on a note card. Read samples and templates. When writing a thank you letter, check out some sample thank you letters to get a sense of what you might include in your own letter. You can also use the template below to help you write a thank you letter after a job interview. The template includes tips and advice on what to write in each paragraph of your message. Edit, edit, edit. Before sending, be sure to proofread your letter, and if possible, have someone else do so as well. Double check name spellings and titles. Sending a sloppy letter will not enhance your chances of getting called back. This is an example of a job interview thank you letter. Download the thank you letter template (compatible with Google Docs and Word Online) or see below for more examples. I’m writing to thank you for the time you spent with me during the interview for the retail sales position at the J & L Jewelry Store. I’m excited about the potential opportunity to work with such an excellent company. I believe I’m a perfect match for this job because I am experienced in jewelry design, as discussed during the interview. Furthermore, working at a large department store's jewelry counter has allowed me to meet and collaborate with many people, which I enjoyed. I’d also like to add that I won an award for one of my jewelry designs while I was in college. My knowledge of what makes great jewelry design is a plus. Thank you again for the interview, and I hope to hear from you soon. My cell phone number is 555-555-5555 and my email is morgan.applicant@email.com. If you are sending a thank you via email, you can remove the contact information and date at the top of the letter. You also only need to include a typed signature at the end of the letter. Beneath your typed signature, include your contact information (at least your email and phone number). Thank you for spending time with me during the job interview for the open receptionist position at Johnson & Gamble. I was excited to learn so much more about the company during our interview, and I believe it’s a very impressive company. My skillset makes me the perfect fit for the receptionist position. I have several years of experience answering different telephone systems, along with great communication skills. Plus, I truly enjoy working with people. Thank you again for the interview, and I hope to hear more about the open position in the near future. 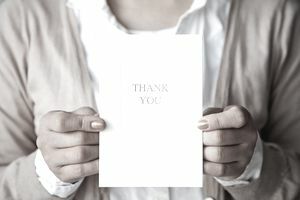 If you are sending a handwritten thank you note in a note card, you do not need to include the contact information and date at the top of the note. You also do not need to type your signature at the end – however, make sure your signature is legible, so the recipient knows who you are. Thank you so much for the interview for the sales position at the G Sports store in North Airington. I love G Sports as a customer, and I know I will be a great addition to the sales team because of my experience in sales and my background in sports. Since G Sports features so many types of skiing equipment and other winter sports, I believe my experience as a competitive skier will be a great advantage.